Feeling intimidated by heading to a yoga studio for the first time? You’re not alone. Yoga studios can certainly be intimidating to first-timers. Nowadays, many people begin their journey with yoga through free online videos and home practice. Transitioning from a relaxed, solo home environment to an in-person studio can be overwhelming and confusing. There is an entire culture surrounding yoga studies, and there are indeed many unwritten rules when it comes to attending a yoga studio. 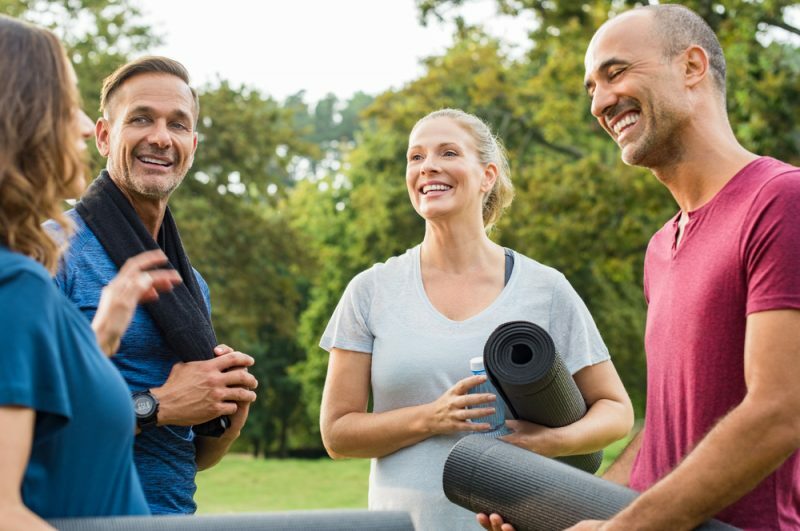 Navigating this new etiquette can be stressful for newcomers – usually the exact opposite experience they are seeking by attending a studio in the first place! This article will take you through the etiquette of yoga studios, and include the most important topics to consider as a beginner. Why Attend A Yoga Studio? Yes, it can be intimidating to head to a yoga studio for the first time, but it is so important to overcome this small barrier, for great rewards await you on the other side. Yoga studios are incredibly special places. They are different from gyms or other places you might take a yoga class because they are completely dedicated to the practice of yoga. Within a yoga studio, your yoga practice will be challenged in a safe way. 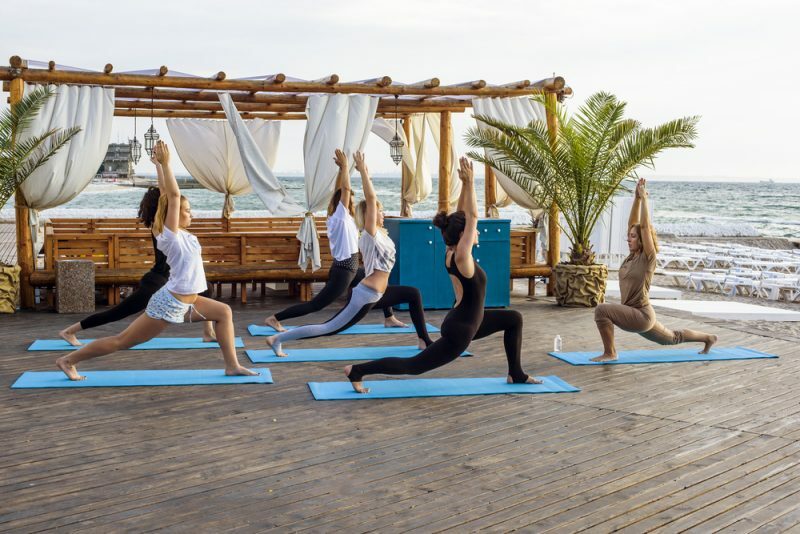 Not only can you find yoga instruction and the benefits of an in-person teacher to offer personalized modifications and alignment tips, but you also benefit from the social environment yoga studios offer. At yoga studios, you will find like-minded yogis and, even if you spend class silently sweating side by side on your mats, you will still benefit from this shared energy. Many yoga studios also strive to create a sense of sangha, or community, by offering retreats, social events, workshops, and more. Although the benefits of attending a yoga studio are multifold, they can be very intimidating to the first time yogi. The following etiquette tips should be carefully read and considered before attending a yoga studio for the first time. They range from social practices to be aware of, to gear and clothing you may need to bring to your first class. Each piece of etiquette advice has roots in respect and responsibility, not just toward the studio owner and teacher, but also toward your fellow students and even yourself. One of the most commonly asked questions that first-time yoga studio goers have is what to wear. The answer will be different for different individuals, depending on what makes you feel comfortable. When choosing your personal yoga clothing, consider factors such as ease of movement, temperature, and modesty. Leggings are generally recommended for yoga class. If it is a hot yoga or power yoga class you might want to wear legging shorts. Avoid loose running shorts as these might be accidentally revealing during poses like three legged downward facing dog. For your top, wear a comfortable shirt that is suited to the temperature of class. Tank tops are generally recommended. You may want to choose tighter shirts that will stay put, rather than loose shirts that will fall up during inversions. Women should definitely wear sports bras. It is also recommended to bring a warmer layer that you can take off as the class warms up. If you are attending a yin yoga, gentle yoga, or slower style class, you may prefer looser clothing and not be as concerned about clothing falling out of place during fast sequences. When choosing your clothing, just make sure it is something you will be comfortable moving in, and is appropriate for the studio setting. Don’t be too concerned with yoga gear prior to your first studio yoga class. The only necessary piece of gear required for a yoga practice is a mat. Studios welcome you to bring your own mat, which is definitely more hygienic, so feel free to bring your personal mat along with you. However, don’t worry if you don’t own your own mat or are unable to bring it. The majority of yoga studios have studio-owned mats that are shared between students. Generally, these are free for use, but some studios may charge a small rental fee. If this is your first class, call the studio ahead of time to inquire about yoga mat policies. When it comes to other gear such as props like yoga blocks, straps, and blankets, most yoga studios will provide these. In regard to more specialized gear that you might own due to an injury, such as a wrist wedge, this is less likely to be provided by the studio so you should bring it yourself. If you have any specific questions about gear, call the yoga studio before signing up for class. One commonly overlooked piece of yoga studio etiquette is footwear. It is traditional in the yoga studio environment to go barefoot. Most studios will provide cubbies or lockers for you to store your shoes and socks after you have signed in, and before you enter the class room. If you are uncomfortable with going barefoot, you can keep your socks on, although most students will be barefoot. Yoga studios are traditionally quiet, peaceful, and contemplative spaces. This is particularly true of the room where the classes are taught. When you are standing in the studio’s lobby, you are free to carry out low volume conversations. If a class is in session, depending on the layout of the studio, you may want to lower your volume even further, so as not to disturb the ongoing class. Once you step into the class room, depending on the studio, you may be encouraged to either be quiet, or even more mindful of your conversations. Chances are, other people early to class may be performing restorative poses or trying to center themselves. It is fine to carry on a quiet conversation with a friend during this time, but be aware of and sensitive to anyone else in the room. Being on time is very, very important in the yoga studio setting. Think of your punctuality as a sign of respect not only to your yoga teacher, but also to other students you might disturb by coming in late. If it is your first time attending the yoga studio, aim to arrive a minimum of fifteen minutes prior to class. This will give you a chance to familiarize yourself with the studio layout, as well as complete required paperwork. If you do arrive late to class for some reason, two things may happen. First, some yoga teachers lock the studio door after class begins. In this case, respect your teacher’s wishes and try again next time. In the second situation, your teacher might leave the room unlocked, in which case you can enter the studio late, but be mindful of your timing. Only enter the studio once active sequences have begun. Most classes start with a short period of quiet meditation. It is not polite to enter during this time, as the room will be silent so the sound of your late entrance will disturb other students. In line with the previous point on respect, make sure you turn your phone off prior to class, for obvious reasons. It is very embarrassing and disruptive for your phone to go off during a yoga class. Ideally, leave your phone in your car. If you must take your phone into the studio, turn it off or put it on silent. Yes, one of the main benefits of attending a yoga studio is having access to a knowledgeable teacher. Your teacher will likely advise you on alignment and philosophy during class. This may bring up questions in your mind, relating either to your personal practice or to yoga in general. Many teachers do accept questions after class, but it is important to respect your yoga teacher’s time. When asking questions after class, try to limit them to a few minutes at most. Chances are, your teacher has a busy schedule and they may be off to teach another class at a different studio shortly. They are also not being paid for the time they spend after class answering your questions. Try to avoid questions that are better served to a doctor or physical therapist, or questions that could easily be answered through an internet search or by paging through a yoga book. For example, if you have a question about yoga philosophy that your teacher may have briefly mentioned during class, approach them by asking for a book title recommendation, rather than demanding they explain the entirety of yogic philosophy on the spot. This doesn’t mean you shouldn’t ask questions of your yoga teacher, just be mindful of their time and qualifications. Maintaining hygiene is a simple but very important piece of etiquette when it comes to attending class in a yoga studio. This is relevant in terms of both maintaining personal hygiene, and the hygiene of your gear. Come to class relatively clean – you do not need to be freshly showered, but at the same time you should not smell offensive. Additionally, if you are using shared mats or props provided by the yoga studio, make sure you clean them before returning them. Most studios provide mat antibacterial spray and hand towels to clean with. On the topic of smell, one piece of etiquette you might not be aware of is limiting perfume or artificial scents. Many people are sensitive to perfumes or scented lotions. In the enclosed environment of a yoga studio, often everyone is close together and sweating, and smells are intensified. Your perfume can become overpowering, or unpleasant if its scent is mixed with any aromatherapy the yoga teacher might be using. Be sensitive toward fellow students and don’t apply perfume or scented lotion prior to yoga class. Personal space is important in the yoga studio, and yes this does come with unwritten rules. Nobody wants you knocking into them in the middle of yoga class. When you are placing your mat, imagine yourself performing yoga poses on the mat. How wide is your arm span? What if you perform inversions – if you fall will you land on the person in front of you? Will you knock into the person behind you during a three legged downward facing dog? These are the questions to consider before setting your mat down. The general rule is to have an absolute minimum of another mat’s width between you and the person next to you. If it is a small class, place your mat with more space. If it’s a full class, you might be closer together. Another easy way to be conscious of personal space is to stagger your mats. For example, when you are placing your mat, place it in line with the empty space between mats in the row in front of you. Yoga studios are a sacred space – this is why it is important to be more conscious of your conversation topics when in the studio. This is not to say you shouldn’t discuss important topics with fellow yogis, but try to avoid being divisive, loud, triggering, or aggressive whilst other yogis may be trying to relax before class, or maintain the peace post-class. 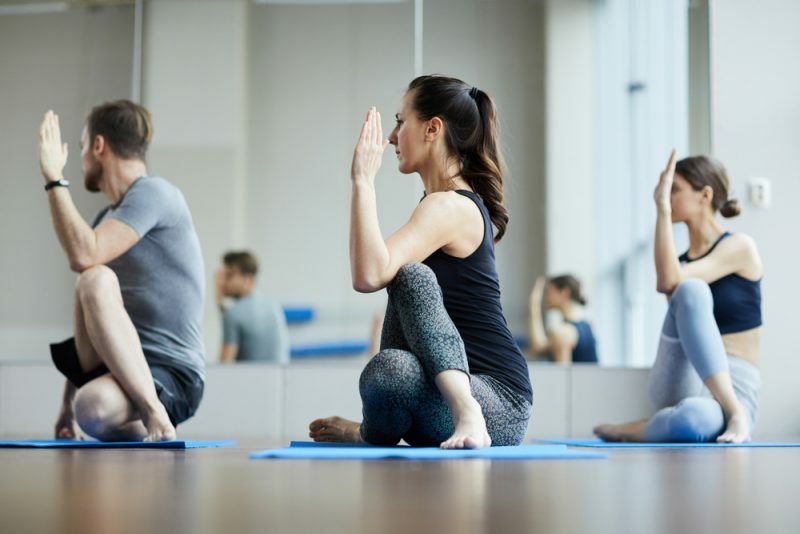 It is important to follow these etiquette tips, not only to fit in and avoid a poor experience during your first class at a yoga studio, but also as a sign of respect to your yoga teacher and fellow students. The etiquette surrounding yoga studios is not meant to be obscure or intimidating, although it may seem like that before your first visit. Rather, yoga studio etiquette exists to best enable you to have the most authentic and valuable experience you can on your mat.